The RENOVA asphalt recycler is a self-contained, easy to operate, versatile, mobile machine that produces hot mix asphalt on site from reclaimed asphalt pavement extracted directly from the repair area itself or your stockpiled millings. The RENOVA also accepts large chunks of old pavement eliminating the need of costly asphalt from the hot mix asphalt plant. The process includes the addition of a proprietary rejuvenant which improves the performance of the entire repaired area. 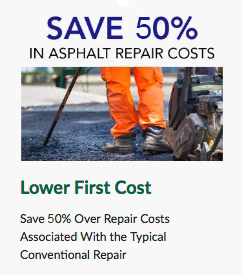 The new asphalt will actually outlast the surrounding asphalt! 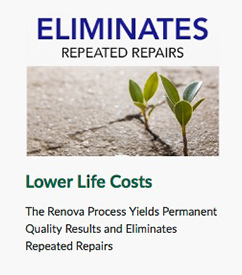 The RENOVA is appropriate for patching potholes, utility patches and other small asphalt repairs year round regardless of the outside temperature. 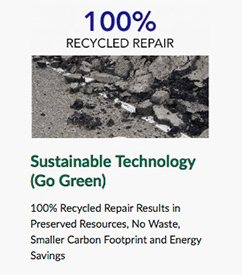 By eliminating the need for using cold patch or a hot mix asphalt plant, the savings you will gain will pay for the machine quickly as you recycle old pavement and patch the area with secure asphalt patch.